on the woodside. : *hot like wasabi. There are plenty of reasons, on your average weekday afternoon, why I decide not to go home and cook. Christmas is a-comin', as they say, and as such I have been rubbing nickels together. Disclaimer: I really, genuinely, wholeheartedly love Christmastime, and I do not begrudge one single dollar bill I have spent on gifts for all my people. It is of course their fault alone that I have no money, and not in any way related to one too many trips to the local Mexican restaurante for queso and margaritas. Unending days of eating out will stir something within a person, though, and that's usually the desire for a home-cooked meal. Unfortunately, that desire usually pokes you in the flabby gut right about the same time that you realize that all those dinners out have ravaged your bottom line (and your bottom). Instead, I will be forced to ogle dinners I made in that halcyon age (about a month ago), when I had money in the bank and velvety salmon with crispy, salty skin on my grandmother's china. As I dreamed up this dinner I knew that I wanted salty soy and bright wasabi and crisp, gingery bok choy, but I needed an earthy element for balance. My first instinct, naturally, was mushrooms, but I have people in my life who won't eat them (weirdos). 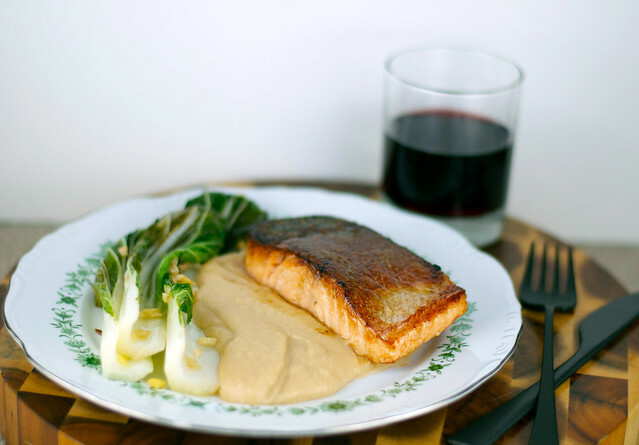 So I did something a little bizarre and introduced the white bean puree—not exactly an Asian staple, but it turned out to be a wonderful, smooth complement to the salmon, and it had that low, rich flavor profile while still being a kind of blank canvas for the wasabi to shine. Which reminds me: Every can of beans and carton of stock is different, so add your wasabi a little at a time, tasting along the way, until you get the flavor you like best. I appreciate the nose-clearing kick, but the beans still mellow things out enough that even the local 3-year-old gave it her stamp of approval. She loved the salmon, too, probably because it's so eye-rollingly simple—I gave the little fillets just a brief dip in the soy sauce, but if your blood pressure is your buddy, feel free to steep them as long as you like for even deeper saltiness. Make sure to put the fish in the pan skin side first, and eat that lovely crispitiness along with the flesh! The bok choy needed work; those white stems were delicious but pretty woody. I did want to maintain the bright greenness of the leaves, so I'd probably just trim off the ends a bit more next time. For me, the ginger, garlic, wasabi paste, soy sauce, and stock are all pantry staples, so I was only ultimately out a few fish fillets, a bundle of bok choy, and a can of beans. Oh, cooking. I didn't mean to quit you. Please come back. I'll be better this time, I promise. 1. Pour soy sauce to a depth of about ¼ inch in the bottom of a 9- by 9-inch square baking dish. Place fillets in baking dish, and marinate about 10 minutes, turning once halfway through. 2. Place beans in a small saucepan with chicken broth to cover over medium-low heat until warmed through. Transfer beans and broth to a blender, pureeing until smooth. Return bean puree to saucepan over low heat. Stir in wasabi paste to taste. Cover, and keep warm. 3. Add 1 tablespoon olive oil to a deep-sided skillet over medium heat. Add ginger and garlic, and cook, stirring constantly, 1 minute or until fragrant. Add bok choy; sprinkle with kosher salt, and stir in rice wine vinegar. Cover, reduce heat to low, and cook 10 to 12 minutes or until tender but still brightly green. 4. Meanwhile, heat remaining 2 tablespoons oil in a large skillet over medium heat; add salmon to pan, skin side down, and cook about 5 minutes on each side or to desired degree of doneness. 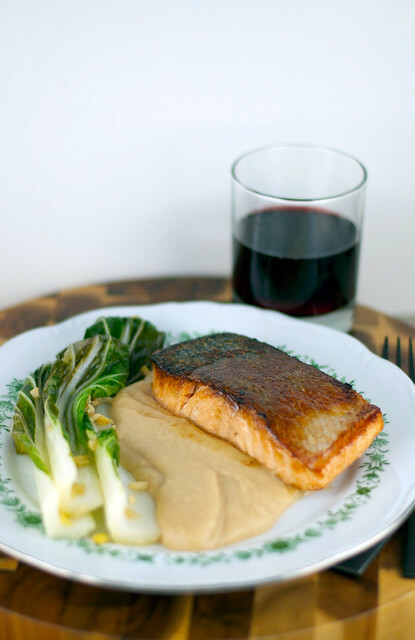 Serve salmon with bean puree and bok choy. Makes 4 servings.